You can just click, click (for some a third click) and unless you haven't as yet filled out your contact information, that is all you have to do and a message is sent. 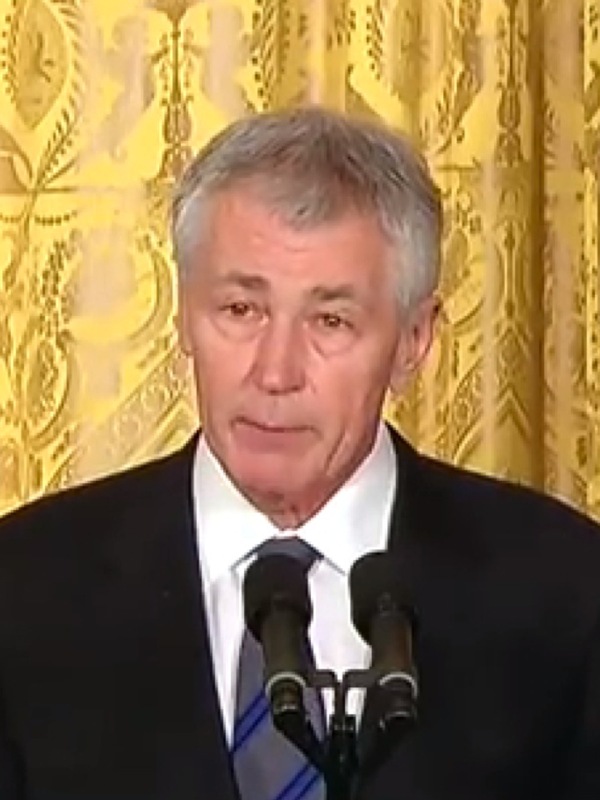 On January 7, 2013, President Obama announced his nomination of Republican former senator of Nebraska Chuck Hagel to replace outgoing Leon Panetta as Secretary of Defense. The Secretary of Defense is second (only to the President) in the military chain of command and directly oversees the Department of Defense and the nation's armed forces. This makes the selection of this cabinet-level position of the utmost importance concerning national security, thus requiring a scrupulous vetting of the nominee. A careful examination of Chuck Hagel and his record in the Senate reveals that he is more than just unfit for the position but is also likely to severely debilitate or compromise United States national security. On May 14, 1998, Sen. Hagel voted to table (kill) the Hutchinson Amendment (S.Amdt.2387) to the National Defense Authorization Act of 1999. This amendment would have required the President of the United States to "compile a list of persons who are Communist Chinese military companies and who are operative directly or indirectly in the United States or any of its territories and possessions," and to "publish the list of such persons in the Federal Register." The amendment would have also given the President the authority to invoke sanctions against front corporations of China's People's Liberation Army, which is the military arm of Communist Party of China. Although the amendment and bill passed the Senate, it was subsequently referred to the House Committee on National Security, where no action was taken on it, and thus it failed to pass Congress. In addition to his voting record above, in 2000 Senator Hagel endorsed President Bill Clinton's decision to "not deploy a limited national missile defense system." Hagel explained that missile defense "must move forward on four parallel tracks  technology, Congress, our allies, and the Russians." While Hagel believes that a U.S. missile defense system should only be deployed with the cooperation of Russia, he does not consider such cooperation from Russia as important when it comes to reducing nuclear weapons. He has called for "sharply reducing the number of U.S. nuclear weapons, possibly without equivalent cuts by Russia," according to the Associated Press. Hagel is also an advocate of the complete elimination of all nuclear weapons from the face the planet and has worked with Global Zero, an organization dedicated to the same goal. If confirmed, Hagel would be the first incoming Secretary of Defense to be on record calling for the reduction and eventual abolition of the U.S. nuclear stockpile. Hagel's soft stance on Communist China and Russia and advocacy for total nuclear disarmament has earned him recent words of praise from the Communist Party USA (CPUSA). The CPUSA's official newspaper People's World described Hagel as one who does "represent the more sober elements who have called in our national discourse for rejection of the old cold war tactics, the unilateralism and the continual push for wars all over the world." Joe Wendlend, the editor of the CPUSA's theoretical journal Political Affairs, described Hagel as a "real Republican maverick," in an article published on June 2, 2008. Past issues of Political Affairs have touted Hagel, along with some Democratic senators, for opposing the Iraq War and supporting immigration reform, or amnesty. Phyllis Bennis, of the Washington D.C. based Institute for Policy Studies, wrote an article for The Nation magazine, published online on January 8, 2013, entitled "Will Chuck Hagel's Appointment Actually Help the Anti-War Left?" Bennis went on to applaud Hagel for his past remarks about the Defense budget. "And then there's the Pentagon budget. Hagel has called it 'bloated,' pretty amazing for a future Secretary of Defense. Standing to the left of President Obama's center-right military policy is not a very high bar. But again  standing up to AIPAC, the defense industry (and members of Congress accountable to them) and the still-powerful neocons makes the Hagel appointment a good move for Obama. And it gives the rest of us a basis to push much farther to end the wars, to close the bases, to cut the Pentagon funding, to tax the military profiteers. This Institute for Policy Studies' endorsement of Hagel is significant considering that Secretary Panetta also had ties with the IPS during his early years in Congress. It should be noted that during the Cold War era, both the IPS and the Communist Party USA acted as front organizations for the KGB and the Soviet Union. Even today, the IPS continues to work with Marxists within the United States to bring about their desired brand of social changes. Phyllis Bennis also carries communist affiliations of her own. She was a former member of the pro-Soviet Line of March, which was an "Oakland based Maoist organization founded in 1970," according to KeyWiki's online database of communists, socialists, and Marxist subversives. In 2008, Bennis was voted to the steering committee of United for Peace and Justice, where she worked alongside CPUSA leaders Judith LeBlanc and Libero Della Piana. Cynthia Ryan, who has also served on the board of Van Jones' Green For All. On January 9, 2013, the Ploughshares Fund applauded and congratulated President Obama's decision to nominate Hagel as Defense Secretary. The Ploughshares Fund, like Global Zero and the IPS, also advocates vast cuts to military defense spending and the reduction of U.S. nuclear weapons, without an adequate missile defense system in place to defend the country from potential ICBM (intercontinental ballistic missile) attack. Considering his voting record, affiliations, and key endorsements, Hagel is unfit for the responsibilities expected of a Secretary of Defense and his nomination may have grave implications with regards to the defense of our country and the very policies that affect the brave men and women of our nation's armed forces. Click here to email your senators and urge them to vote NO on the appointment of Chuck Hagel as Secretary of Defense. Phone calls can also be very effective, and of course, the most effective way to influence your senators and their staffs is by making personal visits to their offices. Click here for contact information. Click here to view this email alert as an online article. You have received this message because you have subscribed to a mailing list of The John Birch Society. If you do not wish to receive periodic emails from this source, please click below to unsubscribe.